1 Day exploring Paris: See the Notre Dame, Louvre, Tuileries Gardens, Champs-Elysees, Arc de Triomphe, and sunset views of the Eiffel Tower. My suggestion is to spend the first day in a city on your feet and moving around. 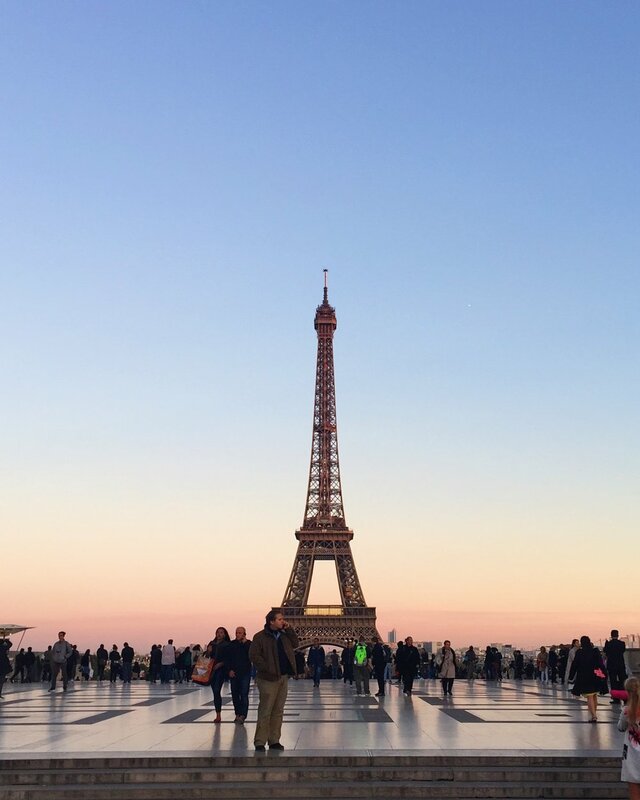 It allows you to fully be on your own schedule (because everyone is effected by jet lag differently), and ensures you get to see some of the main sights in Paris you’ll probably want to fit in. Start your day with a visit to the beautiful gothic church, Notre Dame. If you get here early, this will be the best time to avoid the lines and climb the bell tower, which opens at 10am. There are 387 steps to reach the bell tower, so be in decent shape if you want to tackle this, but the views will be rewarding. Continue down Rue de Rivoli towards the Louvre. Today is just about seeing the exterior and admiring the gorgeous architecture found here. You can also easily cross the street to get a look at the Palais Royale and the beautiful courtyard as well. Lunch at Ellsworth - Inventive variations on American comfort food, in a cozy and well-appointed setting. Around popular tourist attractions, you have to search a little harder for amazing food, but this place certainly is a winner. After lunch, continue your stroll through the Jardin des Tuileries. This garden has a royal feel to it, and is expansive and neatly laid out. One of the best parts of Paris are the beautiful gardens you find throughout the city. They are the perfect compliment to have moments of peace outside the hustle of Parisian streets. Snack at Angelina - Located adjacent to the Tuileries Gardens, this is a spot that will probably be busy and full of people.. Go anyway. It’s the most expensive cup of hot chocolate you’ll probably ever see. Order it anyway. This is also where Audrey Hepburn used to sip hot chocolate. You’ll now continue towards Champs-Elysées and experience the most famous and upscale streets in Paris. It will be packed, and you will be surrounded by selfie-sticks, but walking down this street is a must, especially if you’ve never been to Paris. I would not suggest eating here. However, this is a great time to stop at Laduree, and pick up some macarons that just might change your life. At the top of Champs-Elysées you will find the Arc de Triomphe. If you chose not to start your day with climbing the bell tower at Notre Dame, your legs might be ok with you heading to the top here for sweeping views of the city. (It’s only 284 steps to the top here!) It is one of the most famous landmarks in Paris, and worth seeing even without the climb. End your day with sunset cocktails at Shangri-la Paris. The rooftop lounge is the perfect place to enjoy cocktails and watch the sun set over Paris from one of the most luxurious terraces in the city. This secret space on the 2nd floor is open to the public through September, and gives you an eiffel tower close-up to go with your champagne and tapas. I hope to share other ways to enjoy Paris that help get you a bit off the tourist trail to help you experience some of the local life as well. Check back for upcoming blogs! If you find this information helpful and interesting, sign up for my newsletter to get even more insider tips! Sign up with your email address to receive travel tips and inspiration!